When I got married last July of course it was a crafty affair. 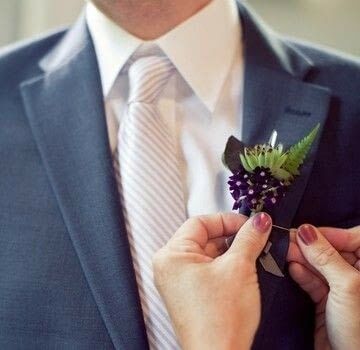 https://www.cutoutandkeep.net/projects/crystal-boutonniere • Posted by Rachel J. 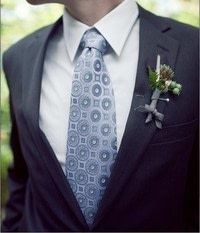 Among the handmade items were the boutonnieres that I made for the men in the wedding party. They incorporated crystals, and here's how you can achieve the same look. Gather your materials. You'll probably want tiny crystals like the ones I used, which are diamantina in a shape known as lasers, needles, or points, and can be purchased online. They're no longer available from the source where I got mine, but they came in an assortment of 5/8 to 2-1/2 inches. Take your crystal and toothpick and overlap them slightly on top of a piece of masking tape a couple of inches long. Wrap the masking tape around the toothpick and crystal several times until they seem secure. Wrap green floral tape around the masking tape to help it blend in. Now add whatever greenery and decorations you want and secure them with floral tape. For my wedding ones I made them the day before the event and used real flowers and plants, but for this example I used some vintage fake flowers and feathers. Try to arrange the other elements so they hide the base of the crystal and toothpick. Wrap ribbon around the base and trim off the end of the toothpick if it’s too long, and you’re done! Here's one that I made for the wedding, with real plants.